When most people think of petroleum they think of gasoline and diesel fuel. They may even conjure up images of jet fuel, but most will rarely consider the other unexpected places that petroleum byproducts show up in modern life. Because crude oil contains a vast number of different hydrocarbons, various refined products have found their way into everything from plastics to pharmaceuticals. The industry that uses petroleum to produce other chemicals is referred to as the petrochemical industry. It is estimated that industrialized nations currently consume petrochemical products at a rate of three and a half gallons of oil per day. That means that, excluding fuel oil, modern life results in each citizen of an industrial nation using over 1,200 gallons of oil per year. One of the most important uses of petroleum is in the production of ammonia to be used as the nitrogen source in agricultural fertilizers. In the early 20th century, Fritz Haber invented a process that allowed for industrial scale production of ammonia. Prior to that, ammonia for fertilizer came only from manure and other biological processes. The Haber process works in two steps. First, methane from natural gas is cleaned to remove sulfur and hydrogen sulfide. It is then reacted with steam over a catalyst to produce hydrogen and carbon dioxide. In the next step, which is the actual Haber process, hydrogen and gaseous nitrogen are reacted at high heat and pressure to produce ammonia, which is siphoned off and added to chemical fertilizers. Agriculture also depends on the use of pesticides to ensure consistent, healthy crop yields. Pesticides are almost all produced from oil. In essence, from running farm machinery to fertilizing plants, agriculture is one of the largest users of petroleum based products. Plastic is a staple of modern life. From computer monitors to nylon to Styrofoam, plastics are integral aspects of many manufactured products. Polystyrene, from which Styrofoam is made, and polyvinyl chloride (PVC) were both products of post-World War II industrialization. Nylon, which is in everything from stockings to mechanical gears and even in car engines, is the most successful petroleum-based plastic to date. Most plastics come from olefins, which include ethylene and propylene. Tires are made of rubber. Until 1910 all rubber was produced from natural elastomers obtained from plants. The need for synthetic rubber was relatively small until World War II, which resulted in embargos on natural rubber from South America and the need to produce synthetic rubber on a large scale. Rubber is primarily a product of butadiene. Mineral oil and petrolatum are petroleum byproducts used in many creams and topical pharmaceuticals. 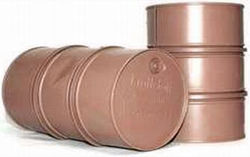 Tar, for psoriasis and dandruff, is also produced from petroleum. Most pharmaceuticals are complex organic molecules, which have their basis in smaller, simpler organic molecules. Most of these precursors are petroleum byproducts. Petroleum distillates such as benzene, toluene, xylene, and others provide the raw material for products that include dyes, synthetic detergents, and fabrics. Benzene and toluene are the starting materials used to make polyurethanes, which are used in surfactants, oils, and even to varnish wood. Even sulfuric acid has its origins in the sulfur that is removed from petroleum.